How Does the Water Savior Work? Spread the word, Save Your Employer, Family and Friends from UNNECESSARY expenses. Landlords: Invest in a product that will make your business more profitable. Pays for itself in weeks, not months! Start saving money and water immediately! 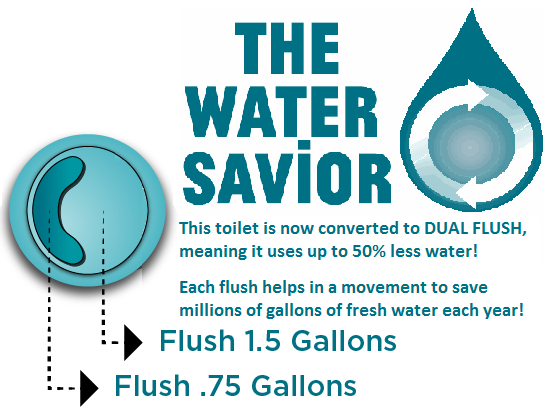 Convert your standard toilet to The Water Savior dual flush system and join the landlords, local business, home owners, communities, and universities saving thousands of gallons of fresh water a year. Dual flush conversion kits begin paying for themselves with the first flush. Silver push button for more water to clear solids. The concept is simple and has been used in Europe and in commercial applications for years. Now, instead of replacing the entire toilet for $50 - $100, simply install a dual flush retrofit flush valve and stop wasting water and money right now. Become a Water Savior! Get yours today! Why become a Water Savior? Rather than use the entire tank to flush liquid waste, The Water Savior flush valve uses just enough water to rinse the bowl of liquid waste. 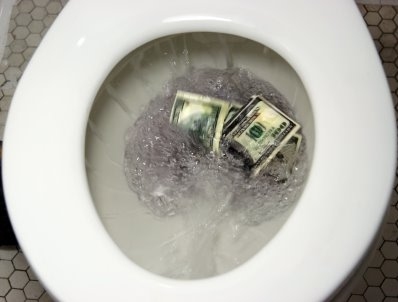 The savings add up with every flush. With The Water Savior dual flush toilets, homes waste less water, cites process significantly less waste water, and by not disposing of old, non-biodegradable toilets, these upgrades also decrease landfill usage.